Performance data of modern PPV fans differ from manufacturer to manufacturer although motor size and impeller diameter is nearly same. This causes uncertainty among firefighters who have to decide about investments in new equipment. How to get comparability? International and common accepted standards are not there: AMCA 240 is preferred by American manufacturers, European manufacturers alternate between industrial standards (DIN 24163, ISO…) and own not validated measurement methods. So how to find an answer, a neutral point of view? Therefore, in order to have a better understanding of the performance of a PPV fan, first two scenarios were investigated. First, the fan running alone and then, when running in a burning building. 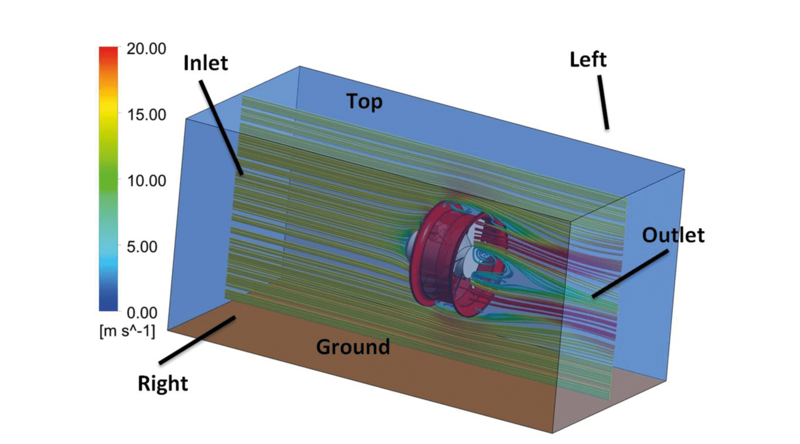 These two scenarios were simulated with computational fluid dynamics (CFD) and their performance characteristics investigated. The fan model chosen was the VM 400 Dex – Model from Rußwurm Ventilatoren, Germany, Figure 1. 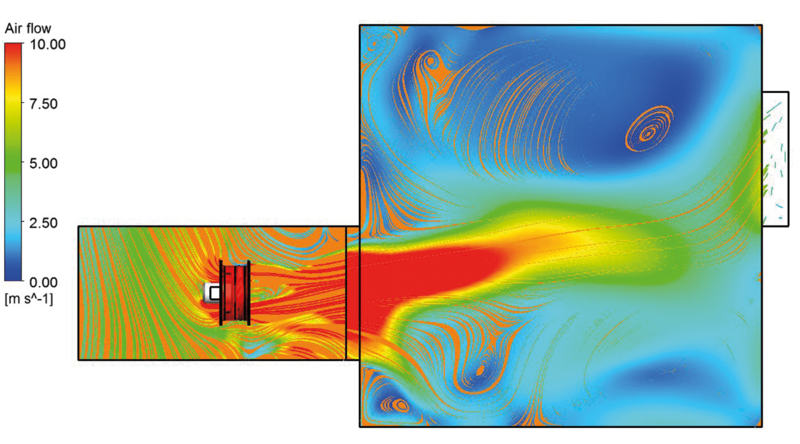 The simulations were done in an academic study at the Coburg University of Applied Sciences, Germany, using the CFD (computational fluid dynamics) software ANSYS CFX. In the first scenario the fan was simulated operating over the ground and with fresh air only. In this scenario two boundary conditions were analysed, see Figure 2. 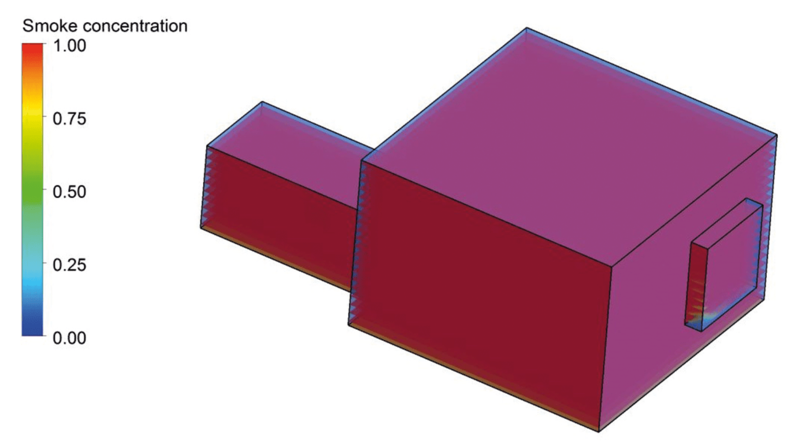 Figure 2: Boundary conditions for CFD Simulations. As it is known from experience, the fan does not push the wind through the blades only. Due to the high velocity of the air flow through the fan itself, also the air surrounding the fan is pulled with the flow due to viscous shear stresses. The amount of air pulled with the fan jet seems to be, at a first look, quite large. This can be seen qualitatively in Figure 3. The amount of flow rate surrounding the fan is about 5 times the flow rate through the fan itself. However, here the fan is operating as stand alone. When operating blowing into a burning room of a building, this situation changes. This was analysed in a second scenario. Figure 3: Air flow through the fan and surrounding it – the surrounding air flow pulled by the fan can be clearly seen. 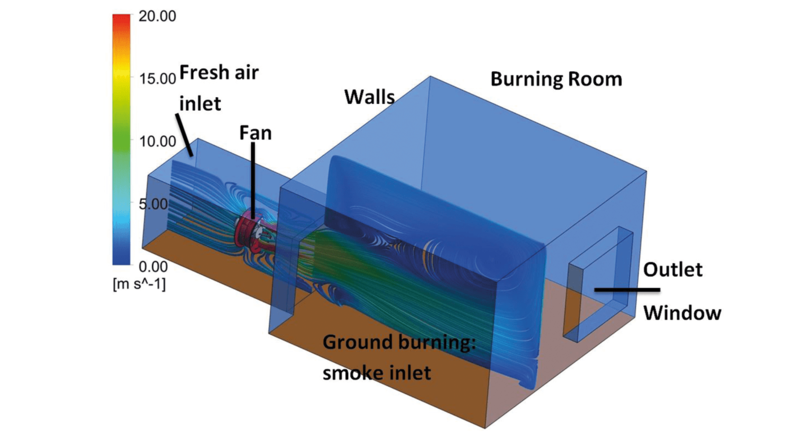 In the second scenario, the fan was used to blow away the smoky air in a burning room, as shown in Figure 4. This flow domain consists of a fan outside the building at the left and of a burning room at the right. The ground in the room is on fire and hence generates smoke. In order to consider the fire on the room’s ground, a two phase flow numerical simulation was performed. The fresh air is coming in from the far left inlet and the smoke is coming in from the ground of the room. The mixture of fresh air and of smoke leaves the room from the window at the far right. The simulation shows that when there is a fire on the ground of the room, all the room and its adjacent spaces are filled with smoke, as can be seen in Figure 5. 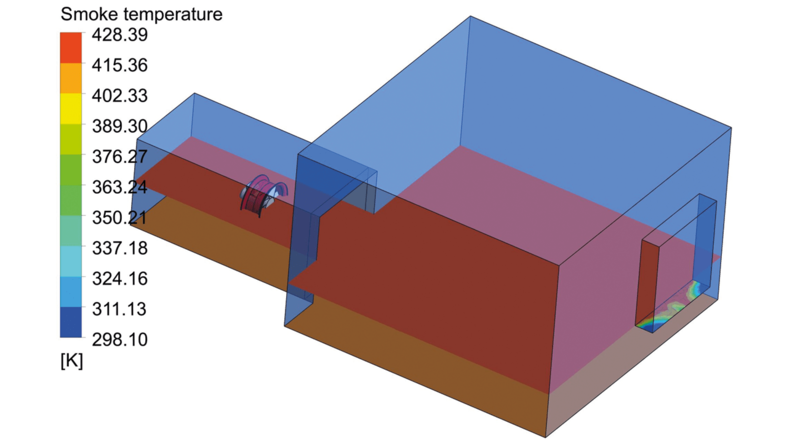 Figure 4: Fan blowing into a burning room. Figure 5: Smoke spreads all over the room when the fan is not running. Turning now on the VM 400 DEX at 2.900 rpm, the smoke almost completely dissipates in the line of the fan and also to a large extent in the whole room, making it possible for fire workers to go into the room to fight the fire and rescue people, Figure 6. Figure 6: When the fan is running the smoke is almost completely dissipated in the line of the fan. A similar effect can be seen looking at the temperature contour plots in the room when the fan is not running, Figure 7, and when the VM 400 DEX is running at 2.900 rpm, Figure 8. Figure 7: Temperature in the burning room when the fan is not running. Figure 8: Temperature in the burning room when the VM 400 DEX fan is running at 2.900 rpm. When the fan is running as stand alone, it was shown above that the flow rate surrounding the fan is about 5 times the flow rate through the fan itself. This is, however, only a local effect. When the fan is blowing into the room, the real question is: how much flow rate is really entering the room, crossing it and flowing out of the window in the opposite side? From the computational fluid dynamics simulations one can read out this data. It comes out, that when the fan is blowing into the building, only an additional 20% of the flow rate flowing through the fan is coming from the fan close surroundings into the building. This can be easily read out from the simulation data when looking at the flow rate coming out of the window and comparing it to the flow rate through the fan in addition to the flow rate coming from the burning ground. Therefore much care is needed when analysing the PPV fan performance. Doing flow rate measurements through the fan and it’s close surrounding only, when the fan is running alone in the lab, will not deliver the right figures. Indeed it will give the wrong impression that the usable flow rate in a building can be as much as 6 times higher than through the fan alone. This is not the case! In reality, for the position of the fan, i.e. the distance from the fan to the room’s door, simulated in this study, the flow rate is only 1.2 times higher than the flow rate through the fan alone. To have a better understanding on the influence of the flow rates in and around the fan, in an additional study, the walls around the fan were also simulated as opening. That means that the PPV fan was placed in front of the room’s door in the open ambient, see Figure 9, and not from a closed room or corridor as in the previous cases. From Figure 9 one can see how complex the flow around the fan can be when pleaced in the open ambient. 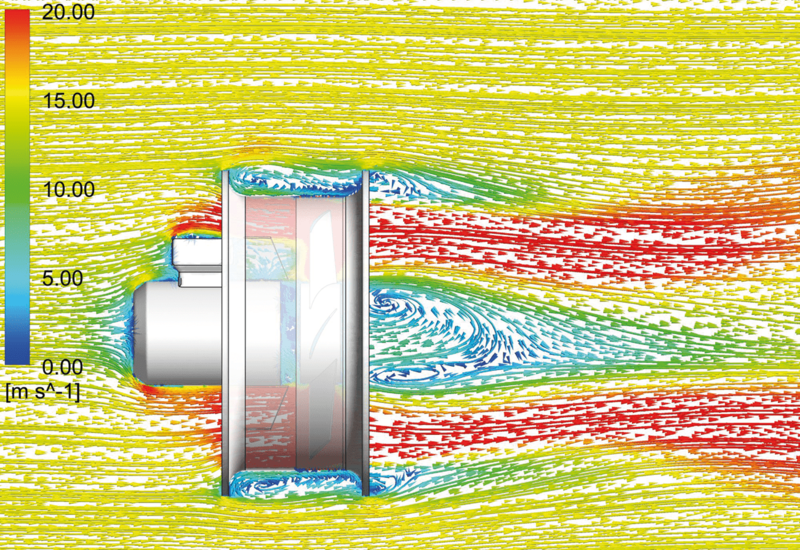 Figure 9: PPV fan blowing from the open ambient into the room. a) Is the PPV fan being operated from the free ambient into the room or is it operating from a closed ambient, i.e. a neighbour room or corridor? b) What is the distance of the PPV fan from the door? c) How much smoke is being generated by the fire in the room? d) What ist the flow resistance of the room, which depends on the size of the room, the number of windows and so on? e) How does this ratio changes when changing the rotating speed of the fan (RPM)? f) How does the smoke coming out of the burning room influences this ratio? In order to have an answer to these questionsa a systematic study has to be performed to find the bounds in which this ratio can vary. Only then the fireworkers can have a confidence margin for the declared mass flow rate effectively generated by the fan. Especially one has to mention under which conditions the flow rate stated in the fan’s specification was measured. Therefore, measuring the effective flow rate of a PPV fan is not a simple task and has to be done under well specified conditions. Perhaps a new standard base has to be carefully established in order to get reliable data sheets with the effective flow rate through PPV fans which can be really used for firefighting. Hans Rußwurm, Rußwurm Ventilatoren GmbH, Germany.